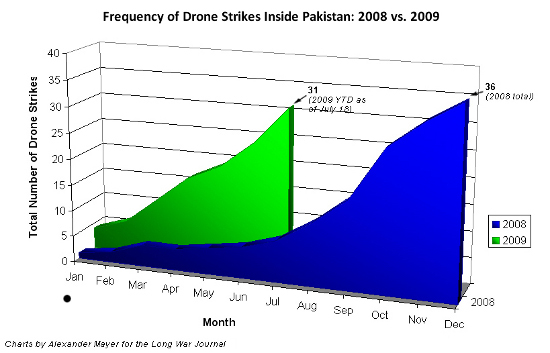 Charts on the number of US airstrikes inside Pakistan per yer, the frequency of strikes in 2008 and 2009, the number of deaths in 2008 and 2009, a distribution of strikes by tribal agencies, and the territories targeted. Click image to view. The dramatic increase of covert US air power to target al Qaeda and Taliban assets in Pakistan’s lawless tribal zones has sparked a controversy in the US and abroad. Critics of the airstrikes, which are carried out by unmanned Predator attack aircraft, contend that the actions violate Pakistan’s sovereignty, kill innocent civilians, and make enemies of Pakistani tribesmen. Proponents of the airstrikes say that they a necessary to prevent the next major attack against the West and disrupt al Qaeda and the Taliban’s operations directed against Coalition forces in Afghanistan. Whatever the case may be, the directive to ramp up the air campaign against al Qaeda and the Taliban in Pakistan’s tribal areas has been issued, first by President George Bush in the summer of 2008, and continued by President Barack Obama only days after his inauguration. A look at the publically available data on the US air campaign in Pakistan shows a marked increase in the frequency in attacks since 2008. These attacks are becoming increasingly lethal. A little more than one in five of the strikes have killed a High Value Target. And an overwhelming number of strikes – nearly 90 percent – have taken taking place against al Qaeda and Taliban targets in North and South Waziristan. Since mid-2008, the United States has dramatically increased the frequency of its airstrikes against al Qaeda and Taliban forces based in Pakistan’s Federally Administered Tribal Agencies. In 2009, the frequency of Predator strikes in Pakistan has continued to trend upwards. There have already been 31 Predator strikes in Pakistan this year (as of July 18) – nearly matching the total of 36 strikes for all of 2008. If airstrikes continue at the current rate, the number of strikes in 2009 could more than double the dramatic increase in Predator activity seen in 2008. With the exception of October 2008, which had the highest monthly total for both number of airstrikes (10) and number of casualties (99), June and July of 2009 have been the most lethal months since the US airstrike campaign began in 2004 (85 and 70 killed, respectively). Some of the most important al Qaeda and Taliban leaders killed by US airstrikes include: Abu Jihad al Masri, the chief of al Qaeda’s intelligence council; Abu Sulayman Jazairi, the chief of al Qaeda’s external operations branch; Khalid Habib, the commander of al Qaeda’s paramilitary Shadow Army; Osama al Kini, the head of al Qaeda’s operations in Pakistan; Abu Laith al Libi, the commander of Brigade 055; Abu Khabab al Masri, the chief of al Qaeda’s WMD program; Abu Hamza Rabai, al Qaeda’s operations chief in Pakistan; and Nek Mohammed, the leader of the Taliban in South Waziristan. Despite these successes, many of the airstrikes have failed to kill senior al Qaeda leaders. On aggregate, since 2004 the US has killed a High Value Target in only 17 out of 76 airstrikes (22%). Of these 22 High Value Targets killed since 2004, nine should be considered top tier commanders. In 14 strikes, the US reportedly attempted to target a specific Taliban or al Qaeda leader (or leaders), but failed to kill the intended target. These strikes have included two failed attempts to kill Ayman al-Zawahiri – who is thought to be hiding somewhere in the Taliban-controlled areas of the tribal agencies – as well as two attempts to take out Baitullah Mehsud, the leader of the Movement of the Taliban in Pakistan, who is based in South Waziristan. It was not possible to determine if High Value Targets were targeted in the remaining 45 strikes. There are two reasons for this seemingly low ratio of High Value Targets killed per airstrike. First, the information on the targets is obtained from open sources, such as the media, so it is not always evident who or what was the target of a specific the attack; second, not all of the airstrikes have targeted al Qaeda and Taliban HVTs. One major objective of the air campaign has been to disrupt al Qaeda’s network and prevent the group from striking at the US and her allies. Al Qaeda and Taliban training camps that are used by al Qaeda’s external operations branch have been a primary target. The external operations branch is tasked with carrying out attacks in the US, Europe, and India, and against other allies of the West outside the Afghan-Pakistan region. Al Qaeda operatives known to have lived in the West and holding foreign passports have been killed in several Predator strikes. One such strike on a al Qaeda in South Waziristan on Aug. 30, 2008 killed two Canadian passport holders as they trained in an al Qaeda camp. Another major objective has been to disrupt the Taliban and al Qaeda’s operations in Afghanistan and Pakistan. The Taliban in Afghanistan receive significant support from within Pakistan, and the US has an interest in preventing nuclear Pakistan from becoming a failed state. Taliban groups that are very active against Coalition forces in Afghanistan, such as the Haqqani Network and Mullah Nazir, have flourished in Pakistan’s lawless tribal areas. Several large Taliban training camps that are known to train fighters for the Afghan front were the target of attacks. On such attack took place in the Kurram tribal agency on Feb. 16, 2009. More than 30 Taliban and al Qaeda fighters were killed after airstrikes targeted a a training camp in the Sarpal region of Kurram. The camp was run by Bahram Khan Kochi, a commander of Taliban forces operating inside Afghanistan. Fully half (50.0%) of all strikes have been in South Waziristan. The area around Wana, the largest town in South Waziristan, has been hit by 11 US Predator drone strikes. Targets in North Waziristan have accounted for another 38.2% of all airstrikes. The North Waziristan town of Miramshah (and its surrounding villages) has been the recipient of 12 US strikes. The US has recently been expanding its area of operations, however, directing Predator strikes in other nearby districts, including Bajaur, Kurram, and Orakzai. Two of the strikes have occurred in the Jani Khel region in Bannu, outside the tribal agencies. Al Qaeda’s Shura Majlis is known to have met in Jani Khel in the past. A Taliban commander under Baitullah Mehsud. Suicide bomber trainer for the Taliban and al Qaeda. A senior deputy to Baitullah Mehsud. A senior al Qaeda trainer. Al Qaeda’s external operations chief who was wanted for the 1998 bombings against the US embassies in Kenya and Tanzania. A senior aide to Osama al Kini who was wanted for the 1998 bombings against the US embassies in Kenya and Tanzania. Date killed: January 1, 2009. The leader of the Egyptian Islamic Group and the chief of al Qaeda’s intelligence branch, and directed al Qaeda’s intelligence shura. He directed al Qaeda’s external operations in Egypt. The commander of the Lashkar al Zil or the Shadow Army, al Qaeda’s paramilitary forces in Pakistan’s northwest and Afghanistan. A senior al Qaeda operative. An al Qaeda commander and logistician. The chief of al Qaeda’s weapons of mass destruction program and a master bomb maker. A religious leader, close to Abu Khabab al Masri. A senior aide to Abu Khabab al Masri. Aide to Abu Khabab al Masri. The chief of al Qaeda’s external network. Jazairi was a senior trainer, an explosives expert, and an operational commander tasked with planning attacks on the West. A mid-level al Qaeda leader. Senior military commander in Afghanistan and the leader of the reformed Brigade 055 in al Qaeda’s paramilitary Shadow Army. Second-in-command of the Bajaur TNSM. Camp commander for the Black Guard, al Qaeda’s elite bodyguard for Osama bin Laden and Ayman al Zawahiri. Asad was a Chechen with close links to Shamil Basayev. Al Qaeda’s operational commander. He was involved with two assassination plots against Pakistani President Pervez Musharraf. A senior Taliban commander in South Waziristan who had links to Osama bin Laden and Mullah Omar.